5 Half Board Hotels and 1 All Inclusive Hotel. 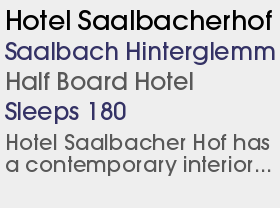 WEsay Reliable snow and a modern lift system links Saalbach with the adjoining village Hinterglemm creating an extensive ski circuit. Great for ski-to-lunchers and night owls. 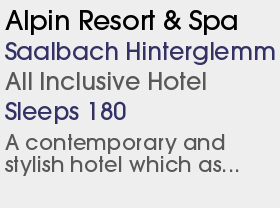 With its massive linked 'ski circus' and traditional Austrian charm, Saalbach-Hinterglemm is pretty much the ideal ski resort. Like many Austrian resorts it has a pretty, traditional-style village and very lively nightlife, but unlike many it combines this with a very extensive circuit of slopes on both sides of a valley, and runs are linked by an efficient modern lift system. Its slopes resemble a French resort more than a traditional Austrian one - with the added advantage of excellent traditional mountain restaurants dotted around. Intermediates have a massive choice of sunny cruising, ski tours and glorious, long runs through trees. Good skiers with thighs of steel can probably do the whole circuit in a day, but it's a challenge! 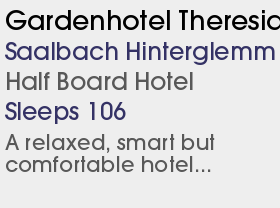 Saalbach is top for snowboarders, with fun parks, wonderful off-piste and a sympathetic lift system. 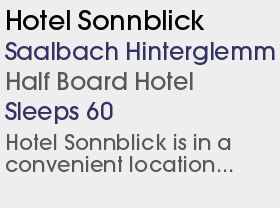 The nursery slopes in Saalbach are located right beside the main street of the town so mummies and daddies can train their prodigious offspring without having to leave the welcoming confines of the shopping or drinking streets nearby. For the advanced skiier there is a two-mile long (3km) expert mogul descent on the north facing Zwolferkogel, and more than 60 miles (97km) of off-piste terrain. You can see the best ski and snowboard talent on display from the local schools every Wednesday and if you didn´t get enough of the pistes during the day, on Tuesdays and Thursdays you can enjoy night-time skiing on the floodlit slope. 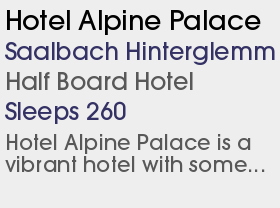 Saalbach's après-ski is very lively and is dominated by Scandinavian and German visitors. It rocks from 3pm until the early hours non-stop. The villages have more than 30 pubs and bars and 9 clubs/discos. 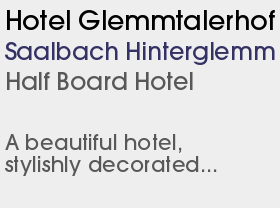 Apart from imbibing or eating, holidaymakers can enjoy a bout of tennis, bowling, sleigh rides or floodlit skiing or take a dip in the Hinterglemm swimming pool or saunas. Or you could take a day trip to visit the nearby thermal baths. Alternatively you could take the two-hour trip to Salzburg, where Austrian composer Wolfgang Amadeus Mozart was born. It's not scheduled until 2018, but at Viehofen, at the eastern most point of the piste network, a small gondola is to be built which will complete a link to Zell am See s Schmitten area. 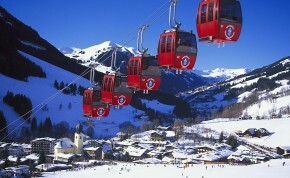 The return trip will include a short bus ride to the Saalbach lifts. The Schonleitenbahn gondola at Vorderglemm is to be renovated; instead of 12-person standup cabins it will have 10-seat cabins, and because there are more of them the capacity will be increased to 3200 people per hour. A short new 10-seat gondola at Hinterglemm will link the base stations of Zwolferkogel and Schattberg West, improving access to the west end of the lift system. A new run and 10-seater gondola linked Reiterkogel on the north side of the ski area to the slopes of Fieberbrunn, briefly creating Austria s largest ski area (now displaced by the Arlberg). The drag lifts on the upper slopes of Bernkogel were replaced by a covered six-seat chair lift with heated seats, effectively removing the last remaining flaw in the lift system. A long new piste was introduced down the length of the Steinbergbahn gondola, opened the previous season at Leogang.